Club gymnasts from across the U.S. will head to Ohio for one of the top club meets of the season: the Buckeye Classic, taking place Feb. 1-2. Featuring a level 10 competition and elite qualifier, FloGymnastics will be on site streaming all level 10 sessions. With more than 200 gymnasts competing, there's a lot of talent to be seen, and here are five gymnasts to keep an eye on. A level 10 gymnast from the host gym Buckeye, Beckwith is a level 10 and former junior elite gymnast who's qualified for the J.O. National Championships twice. She can put up great scores on all four events, but her best event seems to be bars, as she finished in the top 10 on the event in 2017 at the Ohio state championship, Region 5 Championship and at J.O. Nationals. On bars, she has nice, clean lines and does a good job at maintaining her toepoint and keeping her legs together. In addition, she hits her handstands and has competed NCAA-worthy routines. Bars was her highest scoring event at this month's Sand Dollar Invitational, where she earned a 9.650 for third place. She hit the rest of her events for a solid 37.925 all-around score, nearly a point higher than her all-around score from her first meet of the 2019 season. Butler is a level 10 gymnast from American Twisters in Florida who's a fairly strong all-arounder and is capable of scoring a 9.700 on vault, bars and floor. Earlier this month, she competed at the Sand Dollar Invitational and was in the top five on all four events and in the all-around. On vault and bars, she earned a nice 9.700 for fourth and second, respectively. Her 38.300 all-around score was good enough for second place and marked her second all-around score above 38.300 this year. Butler spent the 2017 season as a junior elite and competed at the U.S. Classic. Butler competed at her first J.O. National Championships just one year prior, placing in the top 10 on every event but vault, including a silver on floor and bronze in the all-around. Andrea Li, sister of UCLA legend and 2012 Olympic alternate Anna Li, is a phenomenal gymnast in her own right. She's a four-time J.O. National qualifier and a three-time Nastia Liukin Cup qualifier, helping her maintain her status as one of the top level 10 gymnasts in the country for the past few years. Last season, she won the all-around at nearly every meet she competed at. Andrea has earned a score in the 9.800 range on every event as a level 10 gymnast, a rather difficult and rare feat for any club gymnast. In addition, she consistently earns all-around scores in the high 38.000 to low 39.000 range, making her all-around performances look like those of a NCAA gymnast. At her first meet this season, she swept all five individual events. While she's obviously excellent on every event, bars is where she really shines with her great lines and form. Siegfeldt is a former junior elite and J.O. National qualifier who had a good 2018 season. At the 2018 J.O. National Championships, she was fourth on vault, 10th on beam, 11th on floor and 12th on bars. In addition, she's the reigning Region 7 vault and floor champion and the reigning Virginia state vault, beam and all-around champion. She also won silver on bars and floor at the Virginia state championships, showing she's a strong all-arounder. While she's solid on all four events, she's especially good on vault, the only event she's earned a 9.800 on as a level 10 and the event she won at both state and regionals last year. 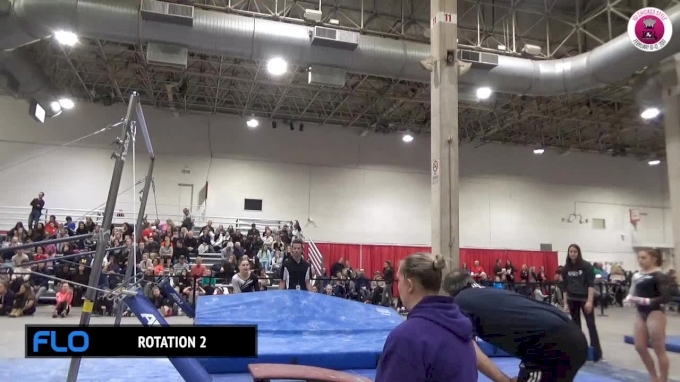 Her form in the air is clean, and she gets good height and distance on her Yurchenko full vault. Smith is a three-time J.O. National qualifier who started her 2019 season on a high note, winning gold or silver on every event at the Ozone Invitational earlier this month. She won bars, beam and the all-around and got silver on vault and floor. Her gymnastics is pretty well balanced. Her past scores don't show a standout event, and she can score very consistently on all four events. At last year's Region 8 Championships and Florida state championships, every score she earned was in the 9.400-9.500 range; she was in the top five on all events and won silver in the all-around with scores in the high 37.000 range at both championship meets.